The Celestial Council convene for one last time in 2015 to, one by one, pass final judgement on their favourite 3DS game of 2015. Representing the hard-working folk at StreetPassUK we have StreetPass Kent’s Victoria Goddard and StreetPass Southend’s Andy Runagall. Seated alongside them on the panel are 3DSBlessed’s very own Cyburn and Cyrus. So we invite you to put your feet up, pour yourself the last of the season’s mulled wine and read up about which games our councillors deemed divine in 2015. 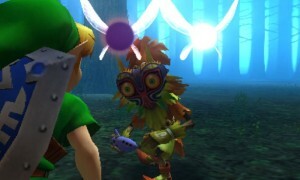 “My 3DS Game Of The Year has to be Legend of Zelda : Majora’s Mask 3D. Nintendo had been hinting at it for a fair while, then our hopes and dreams finally culminated with –that- Direct, containing both its reveal and that of the Special Edition New XL. Anyhow, I digress, this game is my favourite of the year because it is a worthy remake of a game I adored playing as a youngster. The familiarity of the same assets as Legend of Zelda : Ocarina of Time, but the new time travelling mechanic combine to make an eerie, thrilling adventure. “I was expecting Tri Force Heroes to be an updated version of Four Swords Adventures, but that turned out to be not the case at all. Sure, there are similar challenges, and, like Four Swords, it has all the makings of a multiplayer classic, but ultimately it’s not Four Swords Adventures at all. Like Luigi’s Mansion 2, you can choose to play with both Download Play AND Online Play, both on their own or simultaneously. This is handy for both when you’re with your 3DS friends without copies of the game, plus when you’re alone and don’t mind collaborating with strangers (who are nearly always helpful it must be said). One great element of this game which really encourages you to play with others is the Friendship Token system, which allows you to buy more in-line costumes. 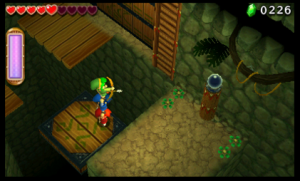 You can choose anything from an old school 8-bit Link costume to dressing Link in Princess Zelda’s modern clothing. 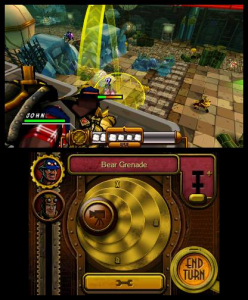 The game, obviously, emphasises co-op, and you do feel rewarded when you acquire a three player team who act as a unit. If you’re horrible, however, you can slack off a bit and troll your fellow players, by throwing them, throwing bombs at them or even slowing up the game. Be warned, however, if you troll a little too much with players that don’t know you so well they may not take kindly to your shenanigans and proceed to put you on their blacklist, which basically blocks you from playing them ever again. In terms of story, there isn’t much of one, as the game is designed around drop-in, drop-out co-op play. In conclusion, it’s well worth a play, and with the game’s price tumbling all the time (at time of writing, it can be had for as little of £17.99) there’s no reason to pass up on it”. “This choice may be surprising to some, but I would consider Codename S.T.E.A.M my game of 2015. The game feels like Advance Wars and Fire Emblem blended together. Characters range from the Wizard of Oz to Abe Lincoln, and their unique weapons and movements give great replay value. The gameplay can be difficult at times, but the payoff is great and it has something to offer both experts in the tactical genre and curious casuals. If you don’t have this game already, I would definitely recommend it”. “I think I will just go with the ‘obvious/easy (and, as a result, quite possibly correct? 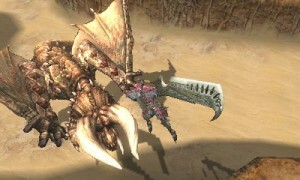 – Ed)’ choice and go with Monster Hunter 4 Ultimate as my favourite 3DS game this year. It improves and enhances almost every aspect of Monster Hunter 3 Ultimate, plus introduces plenty of new content that is well suited to newcomers and veterans of the series alike. Excellent title, 4U is everything a sequel should be”. What was your 3DS Game of 2015?